A year ago, as Europe reached the Moon for the first time, scientists on Earth eagerly watched SMART-1’s spectacular impact. New results from the impact analysis and from the instruments still keep coming. One year on, we present ongoing scientific highlights of the mission. The analysis of data and simulations of the satellite’s impact provide clues on the dynamics of the ejecta after the flash, along with laboratory experiments or modelling of impacts. The experience gained is being put to good use in preparation for future missions. SMART-1 addresses various scientific themes that answer questions on the physical processes at work on Earth-like planets and how they evolve. The moon is a laboratory for geophysics where impacts, volcanism, tectonics and effects of space weather can be studied to put together the story of its past. The geochemistry and origins of the Moon, the evolution of the Earth-Moon system and the bombardment of the inner solar system are topics addressed under lunar formation and evolution. Know-how from SMART-1 is helping prepare the ground for future science and exploration missions. With its unrivalled resolution, in colour and with various illumination angles, the satellite has mapped the polar regions, surveyed lunar resources and investigated potential landing sites and outposts. More than 15 presentations were given by the SMART-1 team during the ‘Europlanet’ European Planetary Science Congress in Berlin, 20-24 August 2007. Topics covered included: highlights of SMART-1 lunar science, new results on coupling between impacts and lunar volcanism for Humorum and Procellarum basins, latest high resolution maps of the lunar Poles and infrared spectra of lunar areas and craters. Mike Burchell from the University of Kent showed laboratory simulations describing the impact crater’s shape and size, predicting ricochet ejecta. As a detailed picture of the impact is taking shape, scientists now know that the spacecraft bounced over the surface, projecting debris at high altitude, which was traced by Christian Veillet with the Canada France Hawaii telescope. Experts from the SMART-1 team are now working on data calibration, analysis, archival and distribution for the scientific community and are supporting collaborations with upcoming lunar missions. This includes refining the lunar coordinate systems, selecting targets observed by SMART-1 and other probes, exchanging tools for scientific planning, or building on SMART-1 outreach or education activities to promote future lunar missions and exploration. “Know-how and data from SMART-1 is forming a bridge for international collaboration and European contribution to upcoming lunar Missions”, says SMART-1 Project scientist Bernard Foing. Chang'E-1, China’s lunar orbiter and JAXA’s Selene are ready to be launched later this year. In Spring 2008, the Indian Chandrayaan-1 will carry three ESA instruments (two of them upgraded SMART-1 X-ray and infrared instruments) to observe the moon. Knowledge gained from SMART-1 and the impact campaign is also helping the preparation of NASA’s Lunar Reconnaissance Orbiter and the Lunar Crater Observation and Sensing Satellite, due for launch before the end of 2008. SMART-1’s high resolution maps are helping characterise future landing sites, in particular at the poles. In the context of ESA’s Aurora Exploration programme and its preparatory activities for a Mars Sample Return mission, a call of ideas was issued for the Next Exploration Science and Technology mission (NEXT) in April 2007. It resulted in more than 70 responses, including more than 30 lunar proposals. 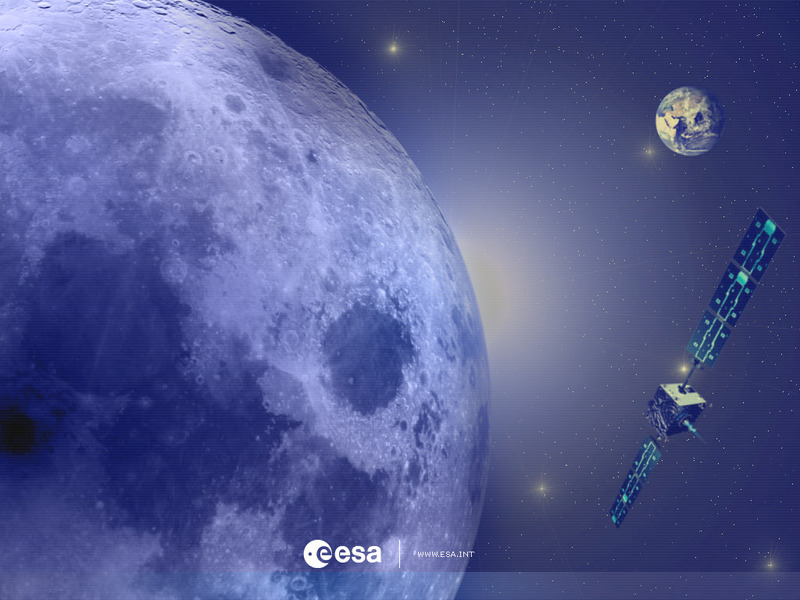 Future European lunar missions concern a large community interested in the scientific and technological potential of lunar landers and sample return missions. ‘Highlights of SMART-1 Lunar Science’ results by B. Foing and the SMART-1 Science and Technology Working Team was presented at the European Planetary Science Congress (EPSC) 2007. ‘SMART-1/AMIE high resolution maps of the Lunar Poles’ by M. Ellouzi, B. Foing, D. Koschny, S. Beauvivre, J-L. Josset & the AMIE Science Team. ‘Coupling between impacts and lunar volcanism for Humorum and Procellarum basins’ by S. Peters, D. Koschny, B. Foing and the SMART-1 AMIE Team. ‘The Smart 1 impact event: laboratory simulation and prediction of crater shape and size’ by M.J. Burchell, R. Robin-Williams, B.H. Foing and the Smart 1 Impact Campaign Team. ‘SMART-1 Moon impact on 3 Sept 2006: results from observation campaign’ by P. Ehrenfreund, B.H. Foing, C. Veillet and the SMART-1 Impact Campaign Team. ‘SMART-1 Collaborations with Upcoming Lunar Missions’ by B. Foing and the SMART-1 Science and Technology Working Team. ‘Relative spectra and spectral slopes of selected lunar craters from observations by SIR on board SMART-1’ by E. Vilenius, M. Wiese, U. Mall and SIR collaboration.